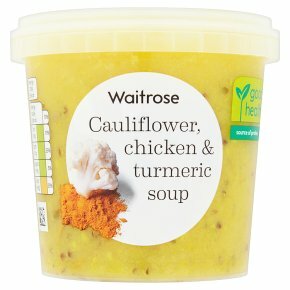 INGREDIENTS: water, cauliflower (18%), chicken thigh (8%), sweetcorn, onion, coconut cream (coconut extract, water), potato, buckwheat, lemon grass, red quinoa seeds, lemon juice, garlic purée, coriander, turmeric, cornflour, lemon zest, chicken extract, salt, onions, black pepper, carrot, leek, parsley, garlic, white peppercorns, bay leaf. Gentle heat 6 - 7 mins. Empty contents into saucepan. Heat gently, stirring frequently, until piping hot. Serve immediately. Do not reheat once cooled.